A question asked quite frequently here on Support, ‘I have entered something wrong! How can I change/remove the transaction?’ Firstly, don’t delete the transaction! If a transaction has been posted incorrectly then it may be possible to reverse it. Within Sage 200, there is an option to delete when amending a transaction. However, this only deletes the post of the transaction, meaning the balances will not be deleted. The best thing to do if you want to remove a transaction, is to reverse it. The important thing to remember when trying to reverse a transaction is the term opposite and equal. The table below shows you the opposite transaction types. 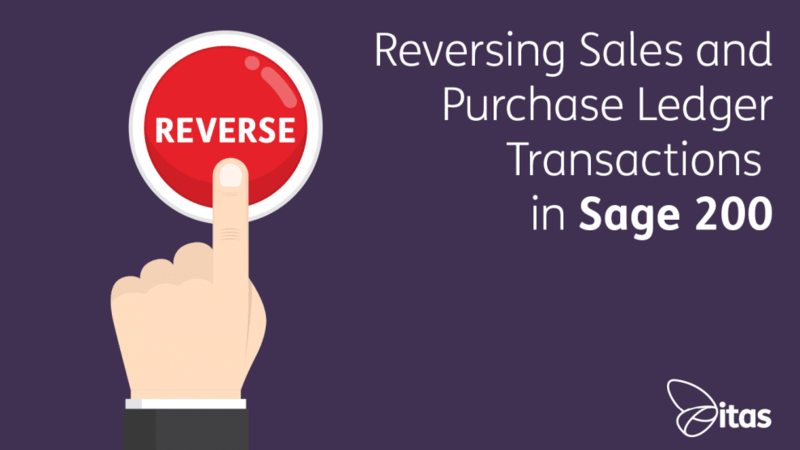 When reversing a transaction you have created, you must now create a reversal (see table above for opposite transaction types). 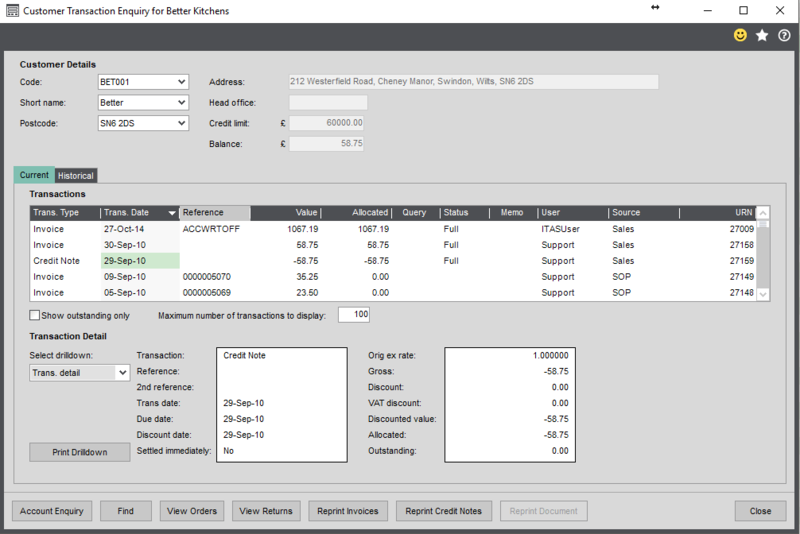 For this example I will use an Invoice as the transaction, so a Credit Note will be needed for reversal to create an opposite effect. When manually reversing a transaction, make sure that the Credit Note is made up with the same information as the Invoice (same supplier, date, amounts). Once created, you will then need to allocate the Invoice and Credit Note against one another. This is important to ensure both transactions relate to one another. First find the Invoice you are reversing and allocate. Now find the Credit Note associated with this Invoice and repeat (click within the allocate area on the same line and press Allocate). The Difference amount should be £0.00, once saved both transactions have reversed. Luckily, Sage 200 has a Reverse function to make life much easier! This function auto allocates the reversal. This is the preferred method for reversals as it minimises human error by auto allocating the correction and auto fills the reversal. Find the transaction you would like to reverse. Reversing this now brings up the opposite account entry auto filled, meaning all fields are correctly filled to match the original transaction without the need to then go back to amend. Once saved, you will notice the transaction has now disappeared from the Reverse Customer Transactions tab. This is because the transaction has now been allocated and can no longer be reversed. So, what happens when the Reverse Transaction function is not available? Querying Transaction – this means a Query flag has been assigned to this transaction. Sage 200 automatically assigns the following query flags: W for bad debt write off and U for unauthorised. Any other characters will be company specific. This prevents further actions on the transaction until you remove the query flag. If you need to remove a query flag, go back to the Transaction Enquiry. Find the transaction and remove the Query flag by deleting the character from the box. If the character is a W (write off debt) then this cannot be removed. If it is a U then this would need to be authorised before reversing the transaction. Allocated – You cannot amend a transaction while it is allocated, so the first thing you need to do is unallocate it. If a transaction has already been allocated then the transaction (example Invoice) has already been matched off with another (example Credit Note or payment). If this is not correct then it would need to be investigated as these transactions should not need to be reversed if already accountable. To find out if the transaction has been allocated go back to the Transaction Enquiry screen. If you cannot find the transaction make sure that the Show Outstanding Only box is unticked and the Maximum Number of Transactions to display is the amount required to display. 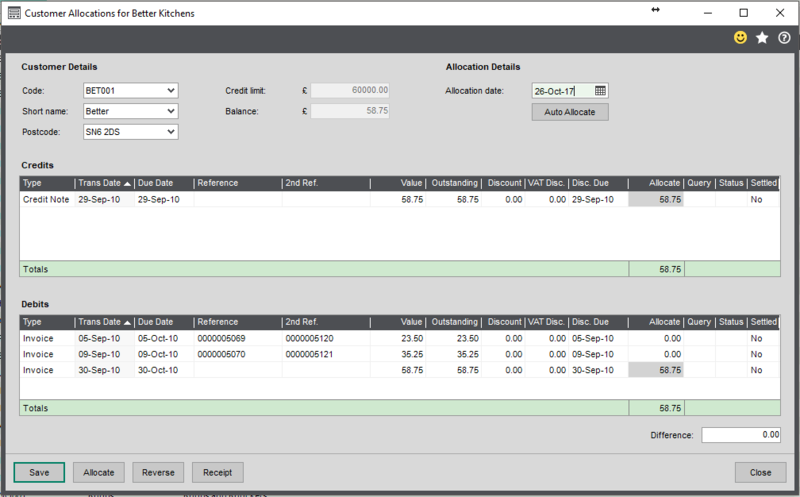 Once you can see the transaction the amount in the Allocated column will show the transaction amount. This can now be reversed. Reconciled in Bank – If a transaction has been reconciled then this cannot be reversed, it first needs to be unreconciled. To find out if a transaction has been reconciled go back to the Transaction Enquiry. If the transaction has been reconciled there will be a date showing on Statement Date. To unreconcile the transaction will depend on the version of Sage 200 you are using. 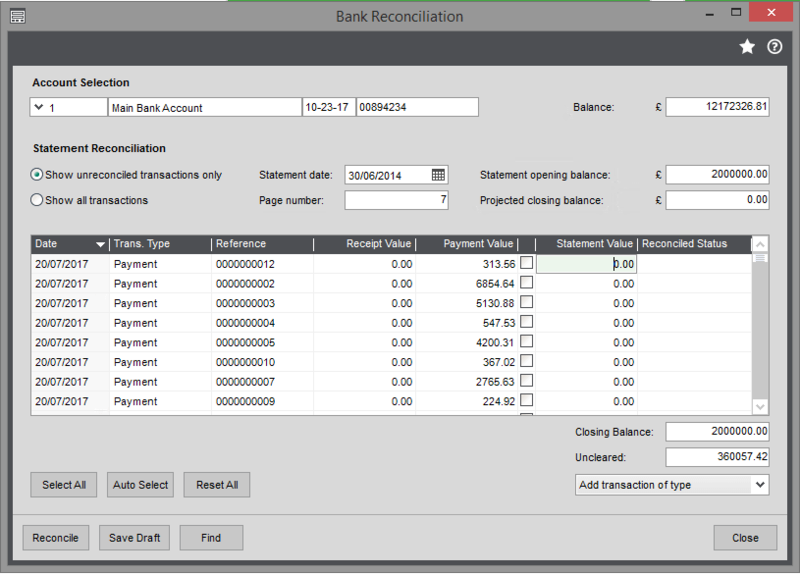 If you are using 2015, you will need to go to Cash Book > Period End Routines > Bank Reconciliation. Make sure that Show All Transactions is selected, find the transaction and change the statement value to 0.00 and hit Reconcile. 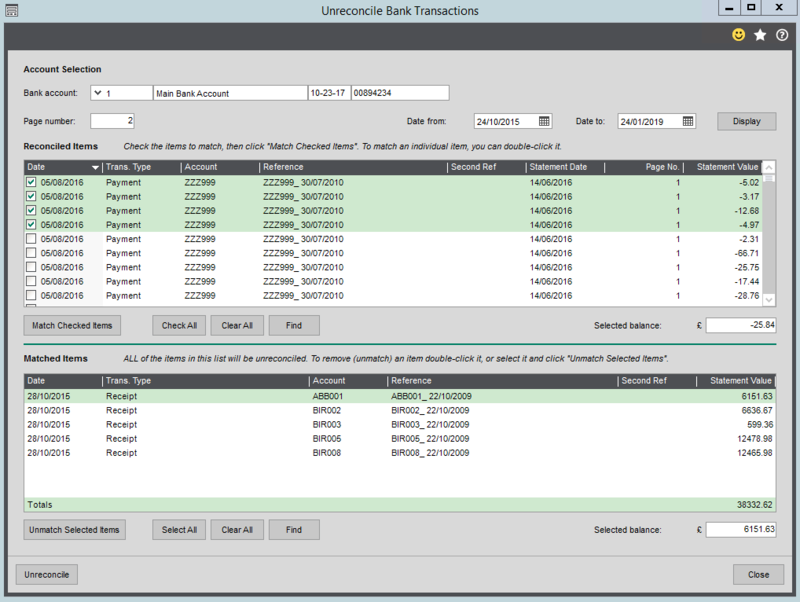 Find the transaction, tick it and then select on Match Checked Items and hit Unreconcile. This can now be reversed using the Reverse Transactions function. Foreign Currency – This cannot be reversed using the Reverse Transactions function but can be done manually. This is to ensure exchange rates are reversed equally. In addition to the equal and opposites to remember mentioned above when reversing a transaction ensure the same exchange rate is used on the reversal. I hope this blog has been useful to you, if you feel that you require further guidance, support or would like to give us any feedback then please contact us!